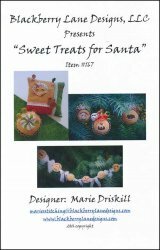 Sweet Treats For Santa Ornaments or Smalls [J5673] - $14.00 : Yarn Tree, Your wholesale source for cross stitch supplies. Cross stitch pattern by Blackberry Lane Designs. Eight holiday designs that can be finished as Christmas ornaments, pincushions, scissor fobs, or gift tags. Stitch count 28w x 28h.